Emerging infectious diseases in wildlife are an increasing threat to global biodiversity. White-nose syndrome (WNS) in bats is one of the most recently emerged infectious diseases in North America, causing massive declines in eastern bat populations. In the Northeast, winter behavior of bats during the hibernation period, such as flying during the day or in cold weather, has been attributed to WNS. However, winter emergence of bats in the southeastern United States, where winters are warmer, has received little attention. The goals of this study were to determine if winter emergence results from infection by Pseudogymnoascus destructans, the causative pathogen of WNS, and to investigate how pathogen load and prevalence vary by species, site, and over time. We collected epidermal swab samples from 871 active bats of 10 species captured outside of hibernacula in Tennessee during winters 2012–2013 and 2013–2014. Deoxyribonucleic acid (DNA) from P. destructans was not detected on 54% of these bats, suggesting that winter emergence occurs regardless of fungal infection. Among infected bats, Perimyotis subflavus (tri-colored bats) had the highest mean fungal load, whereas Myotis lucifugus (little brown bats) had the highest infection prevalence of all individuals captured. Less than 18% (n = 59 of 345 individuals sampled) of all M. grisescens (gray bats) captured had detectible P. destructans DNA on their forearms and muzzle. Hibernacula with large M. grisescens populations had lower fungal loads than sites used by other species; however, mean load per species did not significantly differ between M. grisescens and non-M. grisescens sites. We found that pathogen load and prevalence were higher on bats captured during winter 2012–2013 than in the following winter, indicating that fungal loads on bats did not increase the longer a site was presumably contaminated. Repeated low-dose exposure, mild temperatures, and availability of prey during winter in the Southeast may provide a regional refuge for surviving bat populations. Emerging infectious diseases in wildlife pose an increasing threat to global biodiversity and conservation [1, 2]. A significant proportion of these diseases are the result of “pathogen pollution”: the introduction by humans or livestock of novel pathogens into naïve wildlife populations [2, 3]. Prominent examples of pathogen pollution causing mass mortality are African rinderpest and amphibian chytridiomycosis. In the 1880’s rinderpest killed 90% of Kenya’s buffalo population, resulting in downstream effects on predator populations and ecosystem health . Chytridiomycosis has infected over 50% of all amphibian species and can kill 80% of a population within 4–5 months of its introduction . Such emerging infectious diseases are devastating to native species, with deleterious effects that pervade ecosystems [2, 5]. White-nose syndrome (WNS) is a recently emerged infectious disease that has rapidly spread through eastern populations of cave hibernating bats in North America. It is caused by the psychrophilic fungus Pseudogymnoascus destructans, and was first documented in North America in February 2006 at a cave in upstate New York [6, 7]. This invasive pathogen, which is hypothesized to have originated in Eurasia [8–10], has since spread to more than half of the United States (U.S.) and five Canadian provinces and has killed over 5.7 million bats . Currently, at least six bat species are experiencing detectable population losses due to WNS, wherein once abundant species are now threatened with regional extinction [11–14]. Population declines and the loss of bat species due to WNS are likely to have major ecological and economic consequences, with expected increases in crop and forest pest populations [15, 16]. Pseudogymnoascus destructans colonizes the cutaneous membranes of the muzzle, ears, wings and tail of bats, eroding the epidermis and invading the underlying skin and connective tissue . Once invasion occurs, P. destructans disrupts critical physiological functions such as cutaneous respiration, blood circulation, and water balance [18–21]. These physiological changes result in more frequent arousals from torpor and increased depletion of energy reserves needed for hibernation [21, 22]. Recent studies suggest infected individuals can elicit the initial stages of an immune response (e.g. transcription of cytokines); however, a protective response does not occur due to hibernation [23–25]. Bats with WNS also exhibit aberrant behavior in winter, including movement from thermally stable cave environments to locations near the cave entrance, daytime emergence, and flying in cold winter temperatures [7, 12, 26]. Species-specific behaviors during hibernation, such as microclimate preference, may also play a role in disease susceptibility and survival [14, 27, 28]. In North America, small bodied bats have been known to hibernate at microclimate temperatures ranging from 0 to 10 °C  and relative humidity as high as 90–100%, which fall within the optimal growing conditions for P. destructans. Whereas larger bodied species, like E. fuscus (mean = 12 g) and M. grisescens (mean = 10 g), often roost in colder, drier sites in a hibernacula . European bats, such as M. myotis, a 30 g species, have been found to hibernate at microclimate temperatures ranging from −4 to 12 °C , suggesting that there is no optimal microclimate temperature for hibernating bat species, with individual-specific microclimate preferences within a species ranging widely [31, 32]. Myotis myotis is the most frequent bat in Europe documented with P. destructans and ulcerations leading to the manifestation of WNS [27, 33–35]. Naturally occurring P. destructans infections on M. myotis have been found to be quite extensive, yet have not lead to widespread mortality of the species . Overall, the most affected bat species in Europe are larger bodied species, whereas in North America, small bodied individuals have experienced the largest population declines due to WNS [13, 14, 36]. In northeastern North America, where winters are severe and prey is limited, bats flying outside during the hibernation period are likely suffering the effects of WNS. However, bats in the southeastern U.S. are known to leave hibernacula to feed on warm winter nights [Bernard et al. unpublished], suggesting that winter activity in the South may not be a consequence of disease . As an example, minimum night time temperatures throughout January in Tennessee over the last four years ranged from −17 °C to −6 °C, whereas external cave temperatures in Vermont ranged from −27 °C to −17 °C, consistently 10 °C colder . As WNS has now spread throughout much of the southeastern U.S.  the possible effects of winter activity on the epizootiology of WNS remain unknown. Winter foraging on insects may provide bats hibernating in southern latitudes with energy not available to bats in the North. Further, arousing from torpor to engage in episodic feeding during winter will raise body temperature, which should activate the immune system and possibly bolster immunological defenses against P. destructans. Evidence from rabies in bats , as well as other host-pathogen systems [41, 42], demonstrates that host immunity can result from repeated low-level exposure to pathogens. Behaviorally and physiologically, bats in the South may be different from northern bats in ways that enable them to survive WNS. To investigate possible effects of winter activity on P. destructans infections on bats in southern latitudes, we examined fungal load and prevalence on bats captured outside of hibernacula during winter. In this study, we assessed prevalence and fungal load of P. destructans and identified lesions and ulcerations caused by penetration of P. destructans into wing and tail membranes for ten species of bats captured while active outside of hibernacula during two winters in Tennessee. Our goals were to determine if emergence during winter is caused by the presence of P. destructans and to examine if there are relationships between winter activity, fungal load and prevalence, and bat species. To address these goals, we tested the following hypotheses: 1) active bats leaving caves during winter in the Tennessee will show signs of WNS as demonstrated by fungal load or ultraviolet fluorescence; 2) fungal load and prevalence will be higher on small-bodied cave hibernating species, such as M. lucifugus (little brown bats), M. septentrionalis (northern-long eared bats) and Perimyotis subflavus (tri-colored bats), than larger bodied species, such as Eptesicus fuscus (big brown bats) and M. grisescens (gray bats). We conducted our study at the entrances of five hibernacula in Tennessee from October to April 2012–2013 and 2013–2014 (Fig. 1). Prior to the emergence of WNS, Blount Cave was the largest known endangered M. sodalis (Indiana bat) hibernaculum in the state of Tennessee, with an estimated population of 9500 individuals in February 2013 . Small numbers of M. lucifugus and P. subflavus also occur in the cave. Hawkins and Warren Caves are two of the largest hibernacula for endangered M. grisescens in the state, with estimated populations of 150,000 and 400,000 M. grisescens, respectively. Both caves also contain a small population of M. sodalis during winter . Campbell and White Caves contain populations of M. leibii (eastern small-footed bats), M. lucifugus, M. septentrionalis, and M. sodalis, with fewer than 1000 individuals in each cave . Bats in Blount and Hawkins Caves were confirmed positive for P. destructans in the winters of 2009–2010 and 2010–2011, respectively, with all other sites confirmed by winter 2012–2013 [44, 46]. We captured bats at each site once a month using mist-nets (Avinet Inc., Dryden, NY; mesh diameter: 75/2, 2.6 m high, 4 shelves, 6–12 m wide). Site-specific single-, double- and triple-high nets were deployed 30 min before civil sunset at cave entrances and along corridors within 100 m of the cave. We kept the nets open for 5 h or until we captured 30 bats and closed them when temperatures dropped below 0 °C. After capture, individual bats were placed in paper bags and held for 30 to 60 min in an insulated box with four hand-warmers (HotHands®, Dalton, GA). Myotis grisescens and M. sodalis were held for a maximum of 30 min. We recorded species, reproductive condition, forearm length (mm), weight (g), mite load  and wing-damage index (WDI, ), and collected epidermal swab samples from each bat following established protocols (see below). During the winter of 2013–2014, we examined bats for the presence of WNS-related fluorescence by transilluminating the wings with ultraviolet (UV) light (wavelengths 385–390 nm, [49, 50]). If P. destructans has penetrated the skin, lesions fluoresce yellow-orange under UV illumination . Fungal samples for each individual were collected using a sterile epidermal swab dipped in sterile deionized water and rubbed on the bat’s forearm and muzzle five times each . Swabs were placed in RNAlater® Tissue Stabilization Solution (Life Technologies, Grand Island, NY) and stored at 4 °C. All cave-roosting species were banded with either 2.4 mm or 2.9 mm numbered, lipped alloy forearm bands (Porzana, Ltd., Icklesham, East Sussex, UK) and released at the site of capture. Due to the distance between sites and the lack of evidence to suggest movement occurs between caves during winter in the region, we assumed each cave was a closed population. We extracted fungal DNA from each swab sample using DNeasy 96 Blood & Tissue kits (Qiagen Inc., Valencia, CA; ). All samples, as well as negative control wells distributed across each polymerase chain reaction (PCR) plate, were tested for the presence of P. destructans DNA using a Real-Time PCR assay targeting the intergenic spacer (IGS) region of the ribosomal ribonucleic acid (rRNA) gene complex . All plates were run in duplicate with a quantified standard of isolate P. destructans 20,631–21. Any reaction that crossed the threshold baseline in fewer than 40 cycles on either plate was considered positive for P. destructans DNA and, when relevant, the average P. destructans load, hereafter referred to as fungal load, in nanograms (ng) was calculated in each sample based on the cycle threshold (Ct) value and a generated standard curve based on serial dilutions (; nanograms P. destructans = 10–3.348xCt+22.049). Fungal load values of P. destructans were averaged across both runs. We followed field decontamination protocols in accordance with the United States Fish and Wildlife Service WNS Decontamination Guidelines and recommendations by the state of Tennessee . All capture and handling techniques were approved by the University of Tennessee Institute of Animal Care and Use Committee (IACUC 2026–0514) and were consistent with the guidelines issued by the American Society of Mammalogists . We obtained both federal (USFWS TE-71613A; GRSM-2013-SCI-1053; GRSM-2014-SCI-1053) and state (TWRA 3716; TDEC 2011–031) permits to capture and handle bats at winter hibernacula for this study. Fungal load data were log transformed prior to analyses to meet assumptions of normality and homogeneity of variance. We used separate generalized linear models (function glm in package lme4  in Program R v 3.1.2 ) to compare changes in load and prevalence of P. destructans for each species over time. Models were run as either binomial (prevalence) or Gaussian (fungal loads) distributions, and were tested for significance using likelihood ratio tests. To determine the change in P. destructans load and prevalence over time within each model, we used a modified time axis similar to Langwig et al. 2015  where time-0 represented the start of hibernation (October 1). Infection prevalence was calculated by dividing the total number of infected individuals by the total number of individuals captured during the same time period. All means are reported ± standard error. The results presented herein represent bats captured outside of each site, not of the hibernating population as a whole. We captured and swabbed 871 bats of 10 species (593 males, 276 females, 2 unknowns due to escape; Table 1). Of these, 408 individuals were positive for the presence of P. destructans DNA (Pd+) by Real-Time PCR analysis. At least one individual from all species captured was Pd+, including two Corynorhinus rafinesquii (Rafinesque’s big-eared bat), two Lasiurus borealis (eastern red bat) and one Lasionycteris noctivagans (silver-haired bat) (; Table 1). However, these three species were excluded from the comparative analyses due to small sample sizes. 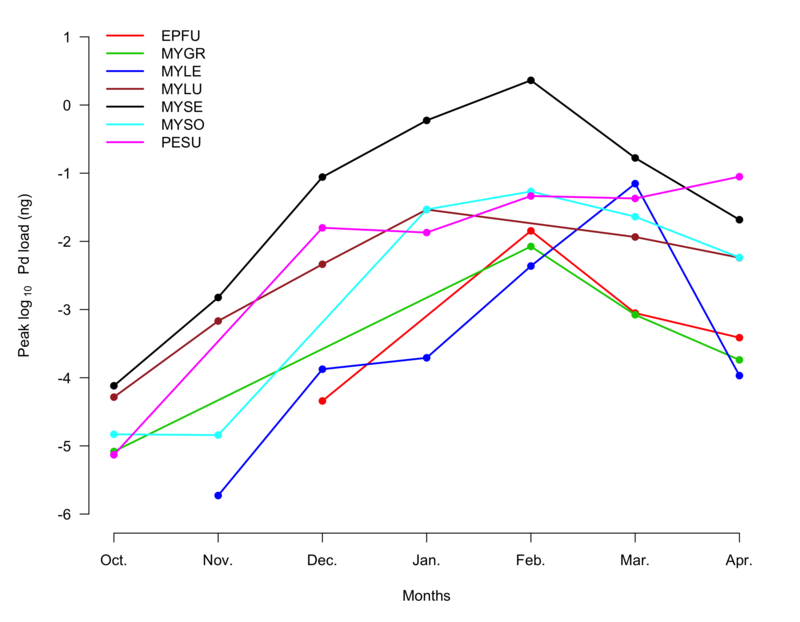 Capture rates of M. septentrionalis, M. sodalis, and P. subflavus dramatically declined during winter 2013–2014, with M. septentrionalis rarely captured after December 2013. Fifty-one percent of the bats captured (n = 245/480) during winter 2012–2013 were Pd+, whereas only 41.6% of the bats (n = 163/391) were Pd + in winter 2013–2014. When pooled by season, mean fungal loads were significantly higher during the first year of sampling (likelihood ratio test: X 2 = 17.978, p < 0.0001). Excluding species with low sample size, there were significant differences in load of P. destructans per species over time (likelihood ratio test: X 2 = 278.06, p < 0.0001, Fig. 2). Fungal loads were lowest when bats entered hibernation in October (−4.99 ± 0.328 log10 ng) and peaked for most species during mid-hibernation (December–February; −2.80 ± 0.095 log10 ng; Fig. 2 and Additional file 1). Thereafter, mean fungal loads on six of the seven species remained stable through the end of the hibernation period in April. However, mean fungal load on P. subflavus, the seventh species, continued to increase through the end of hibernation, reaching levels twice as high as those recorded in December (Fig. 2). Perimyotis subflavus had the highest mean P. destructans load (−2.34 ± 0.091 log10 ng), whereas M. grisescens had the lowest mean P. destructans load of all species sampled (−4.89 ± 0.075 log10 ng). Infection prevalence varied among species, with large-bodied species, such as E. fuscus and M. grisescens, experiencing the lowest prevalence on average (Fig. 3). Fungal loads on active bats in the Southeast were also lower than on torpid bats sampled in a separate study in the northeastern U.S. (Table 2). During the second season of sampling, we examined 481 bats for WNS-related fluorescence. Ultraviolet fluorescence revealed varying degrees of damage due to the fungus, from small pin-sized lesions to large coalescing regions of fluorescence and infiltration corresponding with increased pathogen loads. Only 15 bats that fluoresced showed some signs of wing damage, varying from slight depigmentation to pin holes (WDI = 1). All bats captured during early hibernation (October and November) were negative for UV fluorescence. The highest percent of UV-infected bats were captured during mid-hibernation (December 35.9%, January 29.5%). A total of 66 bats were positive by both PCR and UV, with only two UV positives not detected as Pd + by PCR. A total of 181 individuals were Pd + from PCR but UV negative, whereas 232 bats were negative for both P. destructans and UV. Bats that were Pd + by both PCR and UV had higher fungal loads than individuals that were determined P. destructans positive only by PCR (t 200.6 = 8.83, p < 0.0001). As noted in Zukal et al. 2016 , we did not observe a threshold with which the presence of UV fluorescence corresponded to a minimum fungal load (UV positive: range − 4.74 – −0.22 log10 ng; UV negative: range − 5.73 – 0.36 log10 ng). Our study demonstrates that the emergence of bats during winter in Tennessee is not indicative of WNS, as less than half of all bats captured outside of the caves sampled during the hibernation period were positive for P. destructans. Although we can only make inference directly to bats captured outside of hibernacula in Tennessee, we find a wide range of P. destructans loads on captured bats. As we are not only sampling high-load individuals leaving the hibernacula we, therefore, can assume that our results are representative of the entire population. By capturing bats active during winter and coupling winter activity with measures of prevalence and load of P. destructans on bats, we highlight the regional differences in the responses of WNS affected species within their greater geographic range. This study demonstrates that as WNS continues to spread throughout North America, it should not be assumed that all individuals within a species will react similarly to the disease. In the Northeast, a secondary symptom of the disease is activity during winter, specifically aberrant behavior, or bats flying during cold weather or during daylight hours [12, 13, 26, 59]. Although, cases of unusual winter behavior have been reported in the Southeast [37, 46], our data highlight that nighttime emergences from hibernacula in Tennessee are not always associated with P. destructans infection. Therefore, the effects of WNS on bats in the southeastern U.S. are not directly comparable to those in the North, as regional and species-specific differences, like degree of winter activity, body condition  and susceptibility to disease [14, 36], likely vary significantly from those in the Northeast. Both infection prevalence and loads varied considerably among species, with all small-bodied bats, except M. leibii, having higher fungal loads and prevalence than E. fuscus and M. grisescens. Species, such as M. septentrionalis and P. subflavus, with high rates of fungal loads and prevalence, were consistently found with the largest regions of fluorescence and wing damage, indicating high rates of tissue invasion by P. destructans . Whereas, M. grisescens, which have low fungal loads and prevalence, were often found with substantial discoloration, wing damage, and tissue loss unrelated to WNS based on negative UV and PCR results, as well as WNS WDI scoring [48, 61]. According to survey records in Tennessee, M. grisescens was often observed with discolored wing membranes and significant scarring and tissue loss prior to P. destructans North American introduction (John Lamb and Troy Best, personal communication). Although transmission of P. destructans among individuals could be associated with the accumulation of the fungus within a hibernaculum based on the time since initial introduction, number of bats, and internal cave conditions, it is important to also consider species specific biology and behaviors. When the Northeast was the leading edge of WNS infection, small, solitary bats, such as M. septentrionalis and P. subflavus, had significantly higher fungal loads than similar sized colonial species [11, 28, 41], suggesting P. destructans was spreading via density-dependent transmission in these two species as cluster size increased . In contrast, our findings suggest that M. sodalis and M. lucifugus, species known to cluster in tight aggregations during hibernation, had fungal loads and prevalence similar to those of solitary species. Therefore, transmission of P. destructans among more colonial species in southern hibernacula may be a function of the frequency, or rate, of infection among individuals within the cluster, rather than the cluster size [14, 34, 62]. Interestingly, M. grisescens, the largest bat that hibernates exclusively in caves in the Midwest and southeastern U.S., had the lowest fungal loads and prevalence of P. destructans among all species sampled (Figs. 2 and 3). This finding contrasts with patterns observed in Europe, where M. myotis and other large bodied hibernating bats have the highest incidence of P. destructans [8, 35, 63]. In the Northeast, disease impacts on M. lucifugus, M. septentrionalis and P. subflavus increased with higher humidity and temperature within roosts, such that individuals sampled in the coldest and driest roosts had significantly lower fungal loads [14, 27]. Myotis grisescens, however, hibernate in aggregations of 100,000 to 1,500,000 individuals  in cold air traps varying from 1 to 9 °C , which are the lowest temperatures at which P. destructans growth occurs . As of spring 2017, M. grisescens have yet to experience any WNS-related declines and their populations appear to have remained stable within Tennessee. Although some M. grisescens that we captured have been identified with secondary fungal infections, skin discoloration, and/or substantial tissue loss [Bernard unpublished data, John Lamb and Troy Best personal communication], we have yet to identify how the species is surviving WNS. Several behavioral traits, such as preferred microclimates within hibernacula, sustained activity and foraging throughout winter  and year-round cave use [67, 68], may enable this species to prevent or minimize the colonization of P. destructans during torpor. When all seven species with samples sizes ≥12 individuals were combined, mean fungal load was highest during mid-hibernation, December through February, the coldest period of the year in the Southeast. Perimyotis subflavus, however, continued to experience an increase in fungal load through the end of hibernation, which could be attributed to the microclimate (11 to 23 °C; ≥ 80% Relative Humidity) used by the species during hibernation [69–71]. Alternatively, in vitro growth curves suggest that P. destructans may reproduce more quickly in cave environments that maintain more moderate temperatures of 10 to 15 °C in winter , which could result in increased growth rates of the fungus in southern hibernacula, and therefore lead to a peak in fungal load within species hibernating within that temperature range. Contrary to our prediction and the findings of studies from northern hibernacula , both pathogen load and prevalence were lower in the second year of the study for seven of the ten bat species captured . By the second survey year, all caves had been contaminated by P. destructans for at least two years. Although this could be due to the decrease in the capture of highly susceptible species (Table 1) caused by WNS related declines within each cave , climatic variation between years could also impact disease spread. Similar trends have been documented after the arrival of Batrachochytrium dendrobatidis, the pathogenic fungal agent of chytridiomycosis in frogs. Pathogen loads in naïve frog populations increased dramatically in the first year, causing a rapid rise in infection intensity and prevalence in densely populated habitats . As the pathogen load on infected frogs increased, many populations suffered from high rates of mortality. However, the survival of infected individuals led to pathogen endemism and population persistence on the frogs. A similar dynamic may be occurring in hibernacula contaminated by P. destructans [74, 75]. Individuals with high pathogen loads perish in the first year, perhaps allowing for individuals with minor P. destructans infections to return to the hibernacula the following winter. Further, some scientists hypothesize that increased incidences of chytridiomycosis are linked to increases in global temperatures creating optimal sites for the pathogen [76, 77]. Similar responses may occur with WNS if regions of the Southeast experience more extreme winters, creating more favorable conditions for P. destructans growth or limited opportunities for bats to replenish fat stores. Repeated low-level exposure to P. destructans or endemism of the pathogen, mild winters, and episodic feeding may allow for persistence of bat populations hibernating in the Southeast. Recent evidence from the Northeast suggests some populations of bats have the ability to persist and reproduce despite continued exposure to WNS [42, 75, 78, 79]. Comparing P. destructans loads on the same species sampled while torpid in the Northeastern and active in the Southeastern U.S., we find the average fungal loads over the season were consistently lower on active bats (Table 2). Eptesicus fuscus and M. lucifugus captured in Tennessee had lower loads than those sampled in northeastern hibernacula, whereas fungal loads on M. septentrionalis and M. sodalis were similar towards the beginning and end of hibernation. Perimyotis subflavus in the Northeast, however, had higher loads than individuals sampled in the Southeast. Meaningful direct comparisons are lacking due to insufficient numbers sampled in the Northeast. Ultimately, we are seeing that Pd + bats captured in Tennessee have similar loads to torpid individuals sampled in more northern areas of their range, indicating that activity and survival in the Southeast may be more closely linked with short, mild winters and moderate prey levels during winter. The depopulation of naïve bat hosts by WNS will likely lead to chronic population depression  due to the long-term persistence of P. destructans within cave environments. Whereas, mortality in the Northeast can reach 90% within two years of WNS confirmation [12, 13], population declines likely attributed to WNS in the Southeast occur four to five years after confirmation and tend to be less severe in some species [26, 27, 40, 80]. Our findings support the hypothesis that emergence from caves during winter may influence the variation seen in pathogen load and infection intensity among species. By understanding the species-specific dynamics of P. destructans within active winter populations, management strategies, such as regional area closures and bio-control treatments can be implemented more effectively. In the Southeast, mitigation measures, such as cave area closures used to minimize external cave disturbances (e.g. Great Smoky Mountains National Park) or bio-control agents (e.g. Rhodococcus rhodochrous  and chitosan), may work best when targeting hibernacula with small-bodied bats such as M. lucifugus, M. septentrionalis, and P. subflavus; species that are being hit the hardest by WNS in the Southeast [80, 61]. Finally, our study suggests that populations of some bats are persisting regardless of repeated exposure to P. destructans. Although the region is currently experiencing WNS-related mortality within highly affected species, mild temperatures and the persistent availability of prey during winter may allow the Southeast to serve as a refuge for surviving bat populations. We would like to thank Anna Chow, Max Cox, Neil Giffen, Reilly Jackson, Devin Jones, Kitty McCracken, Mariah Patton, and Ana Reboredo-Segovia for help in the field; permitting and field help from Great Smoky Mountains National Park, Tennessee Wildlife Resources Agency, Tennessee chapter of The Nature Conservancy, Tennessee Department of Environmental Conservation, and the Tennessee regional office of the US Fish and Wildlife Service. We would also like to thank Colin Sobek for assisting with lab work at Northern Arizona University, and the White-nose syndrome and North American Society for Bat Research (NASBR) communities for countless discussions, advice, and continued support throughout this study. We would like to thank Melquisedec Gamba-Rios for graphic support and assistance in R, as well as keeping RFB sane while finishing her degree. Finally, we would like to thank all reviewers for their comments on earlier versions of the manuscript. The research presented in this manuscript was funded by the White-nose syndrome research grant through Basically Bats Wildlife Conservation, Inc., University of Tennessee Institute of Agriculture Center for Wildlife Health, University of Tennessee Department of Ecology and Evolutionary Biology, and the US Geological Survey. The datasets generated and/or analyzed during the current study are available in the figshare repository, https://figshare.com/s/e84c3d6178fbe7294d6b. RFB designed the project, collected all field samples, analyzed all data, collaborated on obtaining research funding, and wrote the manuscript. EVW assisted with collection of field samples and collaborated on obtaining research funding. JTF and KLP performed the genetic analyses. GFM assisted with the project design, collaborated on obtaining research funding, and was a major contributor in writing the manuscript. All authors read and approved the final manuscript. Maine JJ, Boyles JG. Bats initiate vital agroecological interactions in corn. Proc Natl Acad Sci. 2015:1–6. doi:10.1073/pnas.1505413112. Boyles JG, Boyles E, Dunlap RK, Johnson SA, Brack V. Long-term microclimate measurements add further evidence there is no “optimal” temperature for bat hibernation. Mamm Biol. 2017; doi:10.1016/j.mambio.2017.03.003. Bernard RF, McCracken GF. Winter behavior of bats and the progression of White-nose syndrome in the southeastern United States. Ecol Evol. 2017:1–10. doi:10.1002/ece3.2772. Weather Underground. 2016. https://www.wunderground.com. Accessed 6 July 2016. Holliday C. White-nose syndrome disease surveillance and bat population monitoring report. 2012. Retrieved from: http://www.tnbwg.org/2012%20White%20Nose%20Syndrome%20Report.pdf. R Core Team. 2017. R: a language and environment for statistical computing. Vienna: R Foundation for Statistical Computing. https://www.r-project.org/. Reichard JD. Wing-damage index used for characterizing wing condition of bats affected by White-nose Syndrome. Retrieved from https://www.fws.gov/northeast/PDF/Reichard_Scarring%20index%20bat%20wings.pdf.